Learn more about one of the most famous volcanoes in Chile. Osorno Volcano is located in the Vicente Perez Rosalez National Park and is recognized worldwide for its great scenic attraction and the views it offers. It is 2652 meters high which makes it visible from Osorno, Puerto Montt and even from Chiloe, it is located 60 kilometers northeast of the city of Puerto Varas. It is a composite stratovolcano belonging to the South Volcanic Zone of the Andes, and in conjunction with the volcanoes La Picada, Puntiagudo and Cordón Cenizos. The upper part of the volcanic building is covered by a glacier, which, despite its retreat, represents a significant volume of water for the generation of lahars. The historical eruptive activity of the Osorno volcano has been characterized essentially by episodes of low explosivity, among which the fissural eruption of 1835 AD stands out. The weak fumarole described since the beginning of the 20th century under the ice of the summit seems to have diminished at present. The last recorded eruption was in 1869. 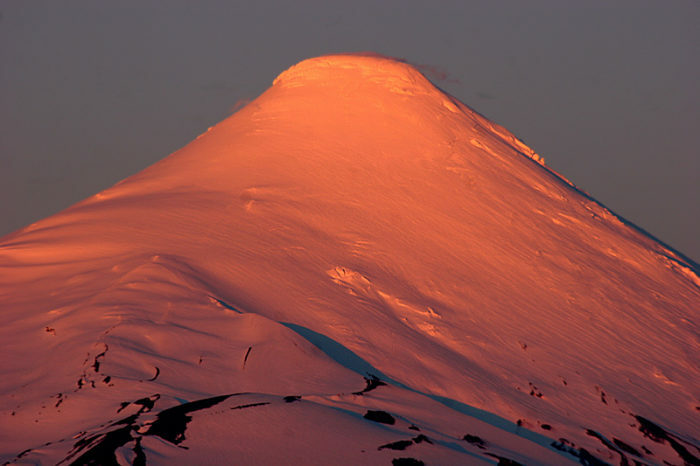 In the slopes of Volcano Osorno there is a ski center, sport in which you can practice almost all year round, if the weather conditions are optimal. In summer, you can do trekking and know the surroundings. On the climb you will appreciate a panoramic view of the Petrohué River valley and you will get to know an extinct crater of the volcano. Another point of great attraction will be the viewpoint from where you can get a panoramic view of Lake Llanquihue and surrounding volcanoes. You can make several walks through the volcano sector and we invite you to relices next to us.